A North Korean teenager has won a global table tennis tournament held in South Korea on his debut in the competition. 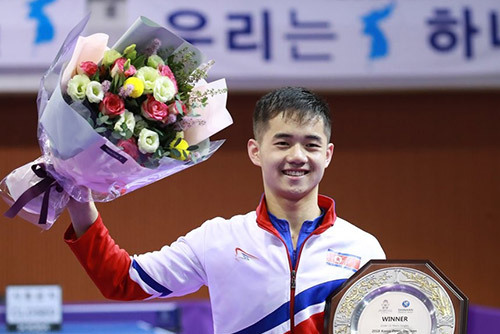 On Wednesday, 19-year-old Ham Yu-song edged out Kohei Sambe of Japan 3-1 in the men's under-21 singles final at the International Table Tennis Federation (ITTF)'s World Tour Platinum Shinhan Korea Open under way in Daejeon. Listed at 175th in the under-21 world rankings, the North Korean defeated four Japanese rivals in a row since the round of 16 on his way to claiming the title. In the quarter-finals, he took down world number four Yuto Kizukuri of Japan. This is North Korea's first appearance at the Korea Open, which is in its 18th year, making Ham the first player from the North to claim a title in any discipline at the tournament.